Cannot complete EFT Insight installation, because it is unable to connect to the ODBC database. EFT Insight requires a connection to the EFT database to acquire data. If the database is not available, it will not complete installation. In the Server > Logs tab, in the Authentication area, with SQL Server selected, provide the username and password to connect to the database. In the Server > Logs tab, in the Authentication area, select Window authentication. 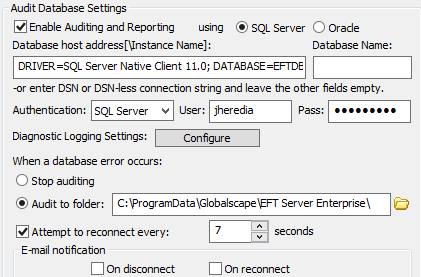 When using an ODBC database in EFT, the ODBC string must be in both the Database host address field, and the uid and pwd fields in the connection string. e.g. : DRIVER=SQL Server Native Client 11.0; DATABASE=EFTDB; SERVER=192.168.102.145\OURTESTSQL; uid=Bob123; pwd=Test123! Article has been viewed 496 times.